We have a wide variety of film specifically designed to adhere to cottons, nylons, polys and specialty fabrics to allow you the greatest versatility. 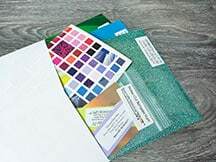 This fun assortment of films gives you endless possibilities from patterns, metallics, glitters, and glows, we have the materials to keep up with the trends of today. We offer the widest variety of printable products for your solvent/eco-solvent, thermal transfer, Latex, or desktop printers.